Iwrestledabearonce have a new singer and a streamlined sound, but with their push and pull between heavy and melodic, they're still having more fun than most metal bands. Iwrestledabearonce is back with a new lead singer and a streamlined sound. Former vocalist Krysta Cameron left the band to have a baby in 2012 and opted not to return. Courtney LaPlante ably fills her shoes, though, bringing the intense screaming and guttural vocals common to metal as well as soaring melodic singing. As for that streamlined sound, the band still throws in elements of many different subgenres of heavy metal and hard rock, but the wilder stylistic departures that marked a lot of their earlier material are mostly absent on Late for Nothing. The band and Century Media have made a good call in releasing "Boat Paddle" as the album's first single. The song opens with LaPlante singing over a stuttering, chunky riff and slides smoothly into the harder-edged screaming section of the song. While Iwrestledabearonce's swaps between harsh and melodic passages usually work just fine, "Boat Paddle" is free of the turn-on-a-dime switches that can make their material more challenging to follow. In addition, the song features an honest-to-god catchy chorus, as LaPlante's refrain of "I've been given all the answers / But I can't even help myself" is an instant sing along. The synths and piano that back up the melodic sections of the song accentuate the singing nicely and provide a nice counterpoint to the wall of guitars and drums in the harsher section. The rest of Late for Nothing is rarely that successful, but it works in fits and starts on individual songs. Opener "Thunder Chunky" operates like a de facto overture to the rest of the record, throwing in just about everything the band is about to do into three minutes and 25 seconds. There's a big, wide open guitar riff to kick things off, and that riff is complemented by light, syncopated drums. LaPlante comes in roaring over the riff, but is quickly double-tracked singing melodically along with her screams. This scream-sing duet technique is very effective in small doses and Iwrestledabearonce uses it sparingly. After about a minute of this, the guitars switch to some wild, skronky atonal stuff while drummer Mikey Montgomery pounds away on his kick drum at a seemingly superhuman rate of speed. The remaining two minutes of the song keep whipping back and forth between the wide open and heavy versions of the main riff, plus a dance-style interlude complete with disco hi-hat and laser beam synths. "Thunder Chunky" is an entertaining encapsulation of what the band does well, but it's not the kind of thing that will have much appeal to those not already attuned to their schizophrenic, short attention span style. Other songs on the album mostly work in this same push-pull milieu. Some of the tracks have a stronger melodic section, some have a better heavier side. 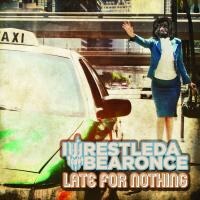 Their music always seems to work best when Iwrestledabearonce finds a balance between the two. "Snake Charmer" starts off as a terrific heavy track, with a huge groove ornamented with guitar pyrotechnics and more of Montgomery's kick drum rolls. But the subdued melodic vocals work as a change of pace even though the song's forward momentum never ceases. "Carnage Asada", on the other hand, has an anarchic vibe through its crazy guitars reminiscent of the early 00's metal heroes Sikth, but its melodic passage doesn't have anywhere near the same impact. What does work here, though, is the Middle Eastern-flavored interlude, with an excellent offbeat guitar solo, some synth brass, and excellent percussion work. Sadly it only lasts for 20 seconds. After the first few songs on Late for Nothing, I was curious to hear what the band sounded like if they did a full track that was either heavy or melodic. Coming right in the middle of the album, "Mind the Gap" is their attempt at the latter. It's essentially a power ballad (though on a non-metal album it'd be considered a mid-tempo rocker), and without the hyperactive guitars and drumming, Iwrestledabearonce sound unfortunately similar to Evanescence. In this context, LaPlante's soaring vocals bear an unmistakable resemblance to Amy Lee's, and the generic backing music does her no favors. Late in the album, "Inside Job" is a more successful attempt at a melodic song. This time around the band doesn't back off on the rhythmic complexity of the drums and they don't turn down the guitars. The twinkling piano accompaniment is a bit much, but the shouted vocals that don't show up until the final 30 seconds feel like a breath of fresh air. Late for Nothing is a solid entry in this small but surprisingly fun subgenre of hyperactive metal. There aren't very many metal bands out there who are willing to risk their image by cracking a smile and goofing around with their music. While this album isn't quite as goofy as their previous records (or as their former tourmates HORSE the Band), the supremely silly video for "Boat Paddle" illustrates that the band is still having a good time, no matter how fast and heavy they play.